Are you looking for the ultimate brunch or breakfast recipe? 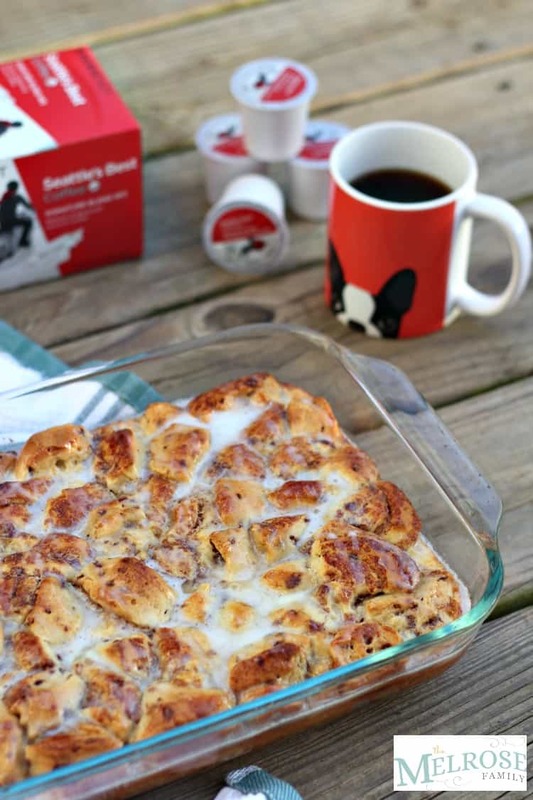 This Cinnamon French Toast Bake is easy and absolutely delicious. Plus, it is the perfect recipe to serve with a large cup of Seattle’s Best Coffee®. Anytime I think of breakfast I get giddy inside. My favorite meal has to be breakfast because, first and foremost, I get a big cup of Seattle’s Best Coffee® with whatever recipe I choose to make and there are tons of variety to choose from when it comes to their coffee. You can discover Seattle’s Best Coffee at Kroger or at Walmart. There’s really nothing quite like the smooth taste and premium beans of Seattle’s Best Coffee® and I love knowing that I don’t need to settle for average and it’s nearly the same price. It’s like a free upgrade from your regular coffee brand. Plus, I can choose a salty breakfast of eggs and bacon or something sweet like this Cinnamon French Toast Bake. No matter which I choose I know that I’m going to start my morning off right. Plus, with this cinnamon french toast bake you’ll have the kids looking for seconds. 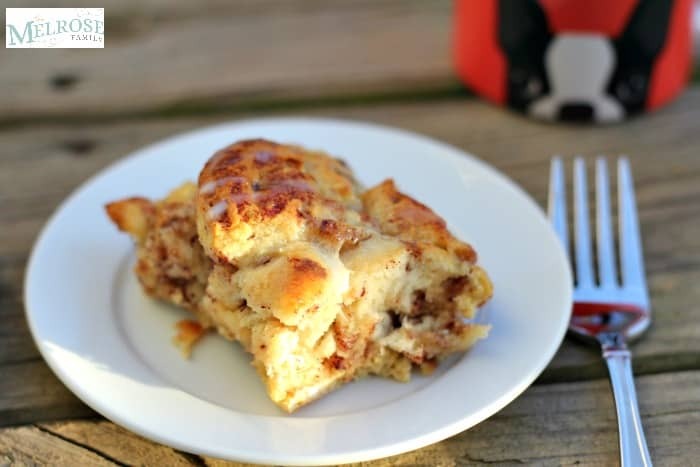 This Cinnamon French Toast Bake is definitely a family favorite. Let’s be honest though. Who doesn’t love cinnamon buns?! 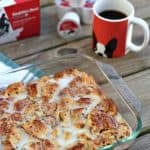 This French Toast Bake combines my love of french toast with my deep love and often craving for cinnamon buns and it’s not a recipe that takes long to put together. One of the worst things about brunch recipes that are perfect for holidays like Easter and Christmas is that they often take forever to put together or they need to be made the night before. Not this recipe though! You can literally wake up at 7:00 and be eating by about 7:40. It’s just that easy. Plus, you won’t miss out on any of the festivities if it is holiday and if it’s just an ordinary day during the week then more power you! Are you looking for the ultimate brunch or breakfast recipe? This Cinnamon French Toast Bake is easy and absolutely delicious. Pour the melted butter into a 13 x 9 baking dish. Break the cinnamon buns into four pieces and place in the baking dish. In a large bowl combine the eggs, half & half, vanilla extract and syrup. Pour the egg mixture over the broken pieces of cinnamon buns. Bake in the preheated oven for 25 - 28 minutes. Melt the cream cheese frosting from the cinnamon buns and pour over the top of the french toast bake. Drizzle with syrup and serve! I made these over the weekend. My husband really liked them, and he is not one to like casseroles. I did sprinkle extra cinnamon sugar over the top before I put on the icing and the syrup.